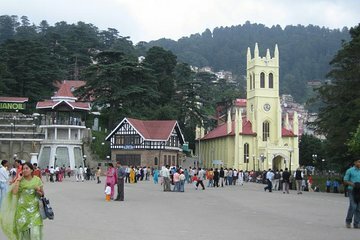 Entdecken Sie während dieser halbtägigen Wanderung die Geschichte und das Erbe von Shimla. Treffen Sie Ihren Reiseführer in der Christ Church und beginnen Sie den Spaziergang durch diese Stadt am Fuße des Himalaya-Gebirges. Sehen Sie lokale Sehenswürdigkeiten wie das Schloss von Betink, die Imperial Bank und das Railway Board Building. Beenden Sie die Tour mit einem Stopp am Indian Institute of Advanced Study. Really felt that our guide was informed and took very good care of us during the tour. It was a bit strenuous at times but she was willing to take it slowly at our pace. I believe it could be improved if you could provide at least one way with a car and one way walking. Because it involves a bit of uphill walking. It also involves us walking around 40 minutes from our hotel to the meeting place. Other then that is it was and the restaurant was fantastic.